A small rural school on the Texas Gulf Coast is helping revolutionize the way educators think about mathematics and education in general. The Port O’Connor School … is a public school with classes from kindergarten through sixth grade. The school has a modest budget and limited resources, and students are typically from working class families, mostly the sons and daughters of shrimpers and farmers. These young mathematicians not only add, subtract, multiply, and divide bigger numbers than much older students in other schools—they also enjoy the learning process. And astonishingly, they are grasping and excited about algebra concepts—as early as kindergarten. “Nothing sets these kids apart except for this new way of instruction: any child from any background can profit from this way of being taught,” says Mrs. Marilyn Bratcher, the principal of Port O’Connor School. She says the Port O’Connor experience is proving that what schools and teachers usually expect of students is far, far below what they can accomplish. “Math books in the state of Texas do the same thing over and over—they’re boring,” says Mrs. Bratcher. “We don’t even use textbooks except as a resource because they’re behind. “In our country, intelligence is equated with math—good math skills open doors for so many good occupations,” she says. Mrs. Anderson began rethinking her approach to teaching after attending a three-week school presented by Dr. Paul Shoecraft at the University of Houston at Victoria. The program was funded with federal assistance made possible by Eisenhower Math/Science Grants and the Education for Economic Security Act. Dr. Shoecraft promotes a revo-lutionary system of teaching math that is shaking the foundation of the educational hierarchy and drawing the interest of prestigious think tanks such as the National Science Foundation. His program, or parts of his program, have been tried or adopted by several school districts, including Calhoun, Comal, Hallettsville, Gonzales, Waelder, Victoria, Beeville, El Campo, Bay City, and Palacios ISDs. Dr. Shoecraft, who has been working on his educational revolution since the early 1970s … says several South Texas Schools are part of this new cutting edge reform movement, but the Port O’Connor School was the first school to fully commit an entire school to this innovative teaching style. Port O’Connor’s Mrs. Anderson was one of the first teachers to take elements of Dr. Shoecraft’s math program and adapt them to a kindergarten classroom and make them work on a sustained basis. Mrs. Anderson has also developed a program called “Math Buddies,” which brings older children from higher grades together with younger kids. Principal Bratcher explains that Math Buddies serves several needs, such as reducing the amount of physical work for the teacher and reinforcing basic mathematical concepts for older students. The math program at Port O’Connor includes many different modes of learning, using many different tables and objects (called “manipulatives”) such as dice, balance beams, and candy. The key to this learning process is that it attracts the student’s attention by asking the child to do more than just listen to a teacher talk. Instead the students are actively involved in the process. Her excitement for the program is apparent, both in the classroom and just talking about it. 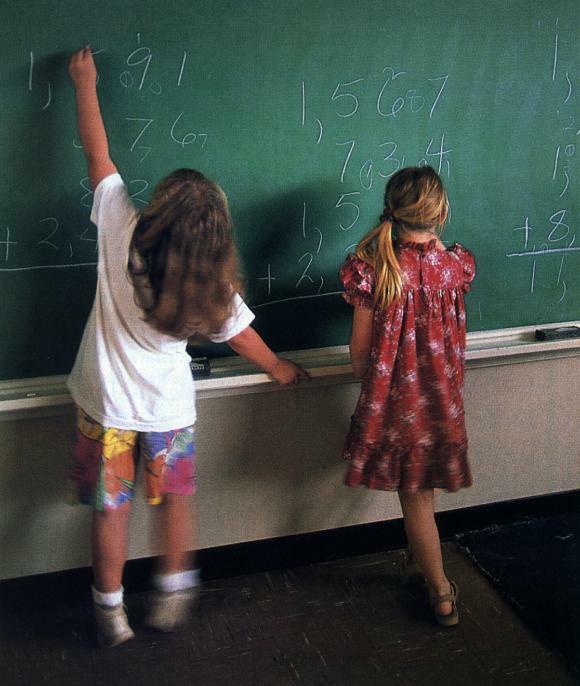 Second graders Tasha Jones and Ashley Hensley work math problems on the chalkboard at the Port O'Connor School.